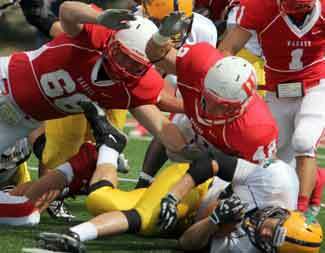 The Wabash College football team suffered its first loss of the 2012 season Saturday to Allegheny, 20-17. The Gators forced overtime and connected on a field goal on their first series. Ian McDougall barely missed a 38-yard field goal that would have tied the game on the following possession. It was Wabash’s first home loss in 13 games and the first time Allegheny has beaten Wabash since 2004. Allegheny’s last win over the Little Giants was also in overtime in a 2004 game. The Wabash defense came in to the game ranked second in the nation in allowing 28.5 rushing yards per game. However, the Gators found success on the ground piling up 176 yards. Allegheny employed a running back by committee, led by Tyler Smith who had 81 yards on 13 carries and one touchdown. The Gators achieved excellent offensive balance and kept the Wabash defense on its heels. Allegheny had 177 yards through the air to go with the 176 on the ground. Allegheny held on to the ball too. It had over 30 minutes in time of possession and didn’t turn the ball over against a Little Giant defense that had thrived on turnovers through the first two weeks. The Little Giant defense was also unable to sack the quarterback after having 11 after two games. Offensively, Wabash struggled to find any consistency, despite having excellent starting field position for most of the game. The team was just 3 of 16 on third down conversions. 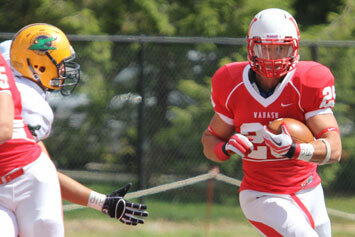 One of the bright spots for Wabash was Tyler Holmes, making his first appearance of the year. The junior running back had 108 yards on 18 carries including a 27-yard touchdown run to put Wabash up 17-10 with 11:37 to go in the third quarter. Holmes made a quick up-field cut through a hole on the left side. He then ran through arm tackles and stiff-armed his way into the end zone. But Holmes’ run was the last Wabash score on the day. Allegheny jumped out to a 10-0 lead after the first quarter. Wabash responded in the second with a 44-yard field goal from McDougall and a three-yard touchdown run by quarterback Chase Belton. Belton had a sub-par day, completing 14 of 32 passes for 137 yards and no touchdowns. With 8:46 left in regulation, Smith ran the ball on the Isolation play up the middle for 9 yards and a score to tie the game at 17-17. The drive was kept alive on a big third down catch and run by Allegheny receiver Derrick Emigh. The diminutive sophomore had a pesky 7 catches for 49 yards on the day. Wabash had opportunities to win the game in regulation. Belton and company took possession of the ball with 4:30 left in the fourth quarter from their own 10. The offense moved the ball effectively including a jumping 15 yard catch by Andrew Gibson over the middle. The promising drive stalled at midfield and Wabash was left to take its chances in overtime. The Little Giants won the overtime coin toss and elected to take the ball second. Allegheny turned to Smith on its only possession in overtime. He picked up a first down and helped set up Ryan Mong’s 28-yard field goal. The Wabash offense went three and out on the next possession which lead to the McDougall miss. The junior connected on a first half 44-yard score, but missed on three other opportunities. Defensively, linebacker Nate Scola was all over the field with 17 tackles, two for a loss. Sophomore backer A.J. Akrinribade added 13 stops. Wabash does not have much time to contemplate the loss. Carnegie Mellon comes in for Wabash’s 100th homecoming weekend Saturday. Carnegie Mellon has won every game this season including a 37-7 victory at Allegheny. The Little Giants know they have their work cut out for them.